A Real Heavyweight of the BMW World. It's a Two-tonne, 400 bhp, £90,000 V12 Coupe. Don’t know about you, but I’d say that £89,000 was a reasonable sum of money. It would certainly buy you somewhere to live almost anywhere in the UK. Car-wise you could spend it on buying ten new Nissan Micras, a Porsche 911 Turbo or Aston Martin DB7. Or a BMW of course. Not just any BMW though, this is obviously very rare and very special. 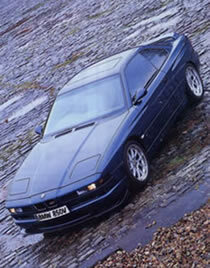 After all, when was the last time you saw a BMW E31? An E what? That’s the E number given to the 8-Series and according to BMW figures only 1510 of these cars were ever built and only 44 were officially imported into the UK. That’ll be rare then. Just don’t confuse it with the slightly more common 850i which was regarded as overweight and underpowered – if you can ever say such a thing about a five-litre V12. A few years ago Gerry Speechley, a 40-year old self-employed car technician, was running a 535i SE and wanted to exchange it for an 850 CSi because he really liked its muscle-car-with-class looks. His local BMW dealer told him they’d keep their eyes and ears open for one but “don’t call us, we’ll call you” – if they ever found one. “As they were so rare, it was basically a case of don’t hold your breath,” remembers Gerry with a laugh. After a while he gave up all hope of ever getting his hands on one so bought an M5 instead. As you do. Then some 20 months after he had first asked, he got a phone call saying the dealer had located one and was he still interested? Of course he was, and it was even in Avus Blue, Gerry’s first choice of colour and a match for his Yamaha V-Max. 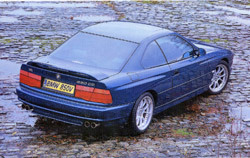 The price was a whopping £89,000 but the M5 was quickly exchanged and a deal was sorted in summer 1999. Good things come to those who wait. This particular 850 CSi was one from the last batch ever produced and according to Gerry, these last few cars were sent straight from the factory to AC Schnitzer so they could work their magic on them, even before they reached the showrooms. The work included uprating the brakes, suspension and the engine but Gerry is a perfectionist and that simply wasn’t good enough for him. Of course with an attractive brake set-up like this you’d be silly to hide it behind standard alloys. Enter £1300-worth of 18 in BBS RKII split rims. Gerry stripped the wheels, got a mate to paint the inside the same colour as brake dust so it wouldn’t show, then got the exterior painted in Audi pearlescent silver and then highly polished the rims. The alloys were then reassembled with 80 Titanium spline bolts, BMW centre caps, BMW metal lapel badges, motorcycle valves and M valve caps – nicked on a regular basis by local kids for their BMX bikes. 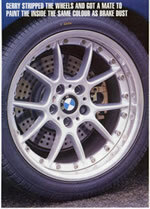 Roadwheel (01276 475577) were then trusted to cover the alloys in Pirelli rubber. Needless to say kerbs are now avoided like the plague. 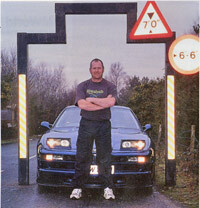 Although the car had already been fitted with AC Schnitzer suspension, that wasn’t good enough for Gerry either. He bought their race suspension package, at £400 for the springs and £2000 for the dampers. The car handled fine, but then it sat too low at the back for Gerry’s liking – almost as if he had several bags of cement in the boot. The rear springs were quickly replaced with a set built in Gerry’s own spec to give the car the higher-at-the-back stance that he was after. Apart from fitting clear repeaters, and some M badges, the only other exterior modification is the carbon fiber front splitter. 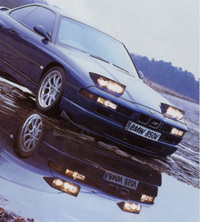 Whilst there might be a wide choice of styling parts for other BMWs, they are certainly in limited demand for the 850. That doesn’t worry Gerry, he just gets stuff made himself, spending £150 on a sheet of carbon fiber, making a cardboard template then cutting it to match and bolting it on. Without wishing to damage his warranty, Gerry’s engine tuning has so far been very restricted but he already has cylinder heads and cams ready for when the warranty expires and he can then up the stakes to around 500 bhp. In the meantime, he’s removed the catalysts and wrapped the entire exhaust system in ThermoTec tape to ensure it keeps the gases hot enough to pass the MOT emissions test. He’s also opened up both of the rear silencers, removed the insides and then welding them shut again. Despite this, the car is still very quiet until you rev it, then it produces a nice rasp - just what Gerry was looking for. At the moment he thinks the engine will be about 420 bhp – it should have been 380 as standard. What’s it like on the road, a bit of a handful? “I always leave the traction control on,” Gerry admits. Apart from during our photo shoot that is, when he managed to spin it! “And I leave the engine management on Sport rather than Comfort. That means that I can get full throttle, all the time. Even then it’s still so quiet and you can’t really hear the engine or exhaust. “It’s surprisingly good on fuel, too – about 18 mpg around town and up to 28 on a long run. The speed limiter should cut in at 155 mph, but because I’ve fitted bigger tyres at the back and got a larger rolling radius and the car takes its speed information from the engine revs and the gears, it now doesn’t cut out until 172 mile-per-hour!” That figure isn’t a guess either, it comes from practical experience and he claims that even at that speed the car is as quiet and stable as at 70 mph. That’s what makes it so deadly. Of course it doesn’t end there. Gerry wasn’t satisfied with the interior of the car and has made a few improvements. His mate, Gary at Spur Engineering(020 8844 0887) was responsible for producing the alloy bits from Gerry’s scribbled diagrams for items such as the door pins, handbrake and various underbonnet shiny bits as well. Then there’s the ICE system. Everything was supplied by Unique (01276 474900) and then fitted by Gerry. The total bill came to about £10,000, and if you want to check out exactly what that involved then take a look at the impressive spec panel. Before he fitted the system, his two kids used to fight to sit in the front passenger seat, Now, they’re more than content to sit in the back and he doesn’t hear a peep out of them until they get to their destination. And with good reason. They have a choice of listening to music, watching TV or DVDs or even playing with the games console. Both of the rear screens can be used independently, and by wearing the headphones there’s no noise interference either. In fact the only display they can’t get in the rear is the voice activated satellite navigation system, that’s understandably only fed to the third screen, located in the dashboard. Once the car is parked though, Gerry’s screen can access the same range of entertainment that his passengers enjoy. 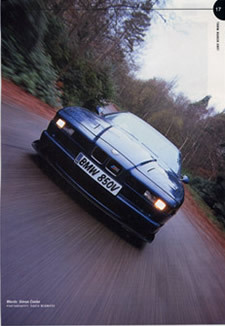 With the 850 CSi not exactly a common sight, a lot of people don’t know what it is and Gerry says it’s often mistaken for an Aston Martin or even a Ferrari. That’s like asking a Lamborghini Countach owner how easy it was to put his kit car together.